When’s the last time you stumbled upon a sign that made you pause and ponder about a deeper meaning? Maybe the sign was meant to be funny, or maybe it was meant to help you find your way somewhere, and yet it made you think about how else the message applied to other areas of your life. The sign hanging in my dentist’s office, “You don’t have to brush all your teeth, only the ones you want to keep,” caught my attention the other day. A few members of the group confirmed that her email responses did come across as rather abrupt and had been a little off-putting. In that moment I debated keeping my opinion to myself and ultimately decided to speak up and offer her another possible alternative to her request. By adding the first part of the sentence, she might positively increase the overall response someone has to her message. In a world where we are all busy and struggling to get everything done, it’s easy to let common courtesy, manners, and social etiquette take a back seat to the task at hand. And yet, without strong relationships what are the chances, you’ll be successful long term in your business? When you think about who you want to work with, refer friends and family to, don’t you prefer to work with someone who cares about the relationship and makes it a priority? Now, of course, the person has to be good at what they do, but let’s be honest, there is always a competitor out there that is good at what you do. Set yourself apart by being good at what you do and taking care of the relationship. You’re much more likely to keep your clients long-term with this approach. 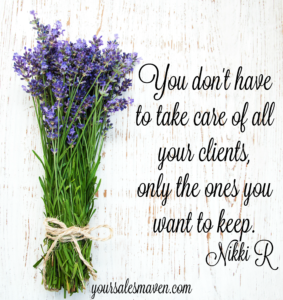 Your Savvy Sales Tip this week: You don’t have to take care of all your clients, only the ones you want to keep. You could easily replace the word clients with relationships in the previous sentence, it’s even more important long term. In the moments where I feel rushed for time is also the best reminder to slow down and write a more thoughtful email response to ensure the relationship stays in good standing.